The Holy Roman Empire of the 16th Century spanned most of Northern Europe. The Kingdom was ruled by a disreputable volatile man whose patronage was afforded to Alchemists, Conjurers, and a private contingent of dwarfs. In the uneasy balance of power between the catholic and protestant churches, the support of the mad King Rudolf’s court, was of utmost importance to the Papacy and to Rome. It was a time of enormous change in Europe with the church still drunk on the fat of the bodies thrown into the fires of Torquemada’s Inquisition. The rest of Europe slowly crawled up from its knees and out of the dark ages in an era when the veils between Science and Sorcery were tenuously thin. 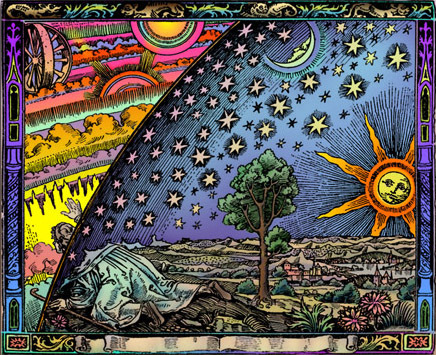 Paradoxically, in a time when even mathematics was viewed as black magick, Europe emerged as a brave new world at the forefront of scientific and philosophical inquiry, giving rise to one of the great ages of learning and discovery, known today as the Renaissance. England was then ruled by the catholic Queen Mary Tudor. Her protestant half-sister Elizabeth was held under house arrest in Oxfordshire. Elizabeth asked Dee to cast her and Mary’s horoscopes, then a dangerous undertaking lest he be seen as contriving and manipulating the fates of monarchs. Dee risking a charge of high treason agreed. His Horoscopes foretold Elizabeth would come to the throne and enjoy a long and glorious reign. Mary’s fate however did not look so favorable. When the Horoscopes were discovered Dee was thrown into gaol. 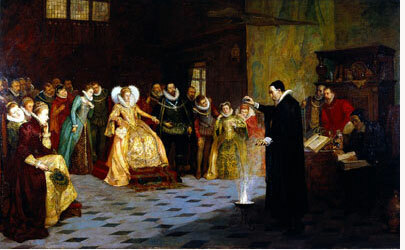 The early rule of Queen Elizabeth I was marred by ill health, almost dying 3 times in the first 10 years of her sovereignty. Still she enjoyed a long and glorious period in power as Dee had predicted. Upon gaining the throne Dee was released and appointed her Royal Astrologer. Elizabeth asked him to choose a suitable date for her coronation that was astrologically conducive . Dee found favor in Elizabeth’s court. His expertise in navigation and his knowledge of its instrumentation, coupled with his extensive library of maps, helped spearhead England’s Golden Age of Discovery. So profound was his influence that the term British Empire was attributed to Him having first pronounced it. Dee was inspired by men like Copernicus and was convinced there were unseen forces governing the way the physical world worked. Dee’s voracious pursuit of these secrets would lead him into an Escher-esque unreality that neither men of science or faith visited. Edward Kelly brought a destructive influence to Mortlake, Dee’s home on the river Thames, and Dee’s wife detested him. A scoundrel by all accounts he was the shadow of Dee’s personality. But it was through Kelly that Dee was able to peer into the supra-dimensional world of the Ether. Complimenting Kelly’s arrival was The Steganographia of Johannes Trithemius (1462-1516), a 15C cookbook of coded languages that Dee believed to possess hidden secret intelligences. It was the first work on cryptography and the manual for which every code was developed since. Dee transcribed the Tome in his own writing. Through Kelly, Dee was afforded a window into a reality where ordinarily one may see protons, neurons and electrical charges, in a universe of microbes, bacilli and virus’. What Dee was privy too were the personalities of those forces of nature and how they worked. After having been given license by the Queen to pursue his work unimpeded by the prejudices of the Church, Dee and Kelly pursued a course with all the voracity of men obsessed. Not only did they want to understand the hidden mechanisms that operated the world, but they sought the keys to unlock the very blue prints that created it. During these experiments which Dee recorded in his diaries both he and Kelly identified 70 differing forces of varying negative, neutral and positive charges. The most outstanding of these was the element Madini whose discovery and correspondences would not only influence the lives of Dee, Kelly and their respective families but shape the course of Alchemical history forever. In 1582 at Mortlake on the River Thames, The Home and Studio of Dr John Dee and his family is visited by The Polish Prince Laskey. Laskey contrives his way into Dee’s confidence and attends his experiments. also in attendance is Kelly. who’s family are sharing tenancy at Mortlake. Laskey’s presence raised suspicion among Queen Elizabeth’s Intelligencia who were dispatched to Dee’s residence by stealth to surveil his behavior. This was a very dangerous time for the young Protestant monarch who’s court was surrounded by Catholics loyal to the Church, whose appetite for empire as history attests surpassed that of her own. Dee Her trusted adviser-! Her Nobel Intelligencia was not only dabbling in the activities which set fires raging across Europe but also cavorted with a rival in an age when assassination was a tenet of international politics. Mortlake was under constant surveillance, and the tension inside was palpable. Through their experiments and their correspondences with the entity known as Madini Dee, Kelly and their families fled the estate for a 6 month voyage to Poland under the patronage of Prince Laskey. Dee was convinced Elizabeth’s chief Spymaster Sir Francis Walsingham was plotting his ruin. Upon their escape Walsingham’s informants ransacked Dee’s Laboratory and Library. Once in Warsaw Dee and Kelly continued a series of experiments they called the Angelic Conversations. The Correspondences intensified culminating in the development of the Enochian Language, purported to be the first language spoken after the Biblical Flood. This language is not derived from any known alphabet but a peculiar set of characters unique unto itself. Over 3000 words have been defined in Enochian. The Enochian language was created to express the primal essence of things. A guttural language when spoken, almost barbarous in its intonation, based on an alphabet of 22 letters It is a system with its own words, grammar and syntax. While resembling no known tongue, it is a system of recording and communicating unto itself. The development of Enochian began on March 26, 1583, when Kelley started receiving what became the first corpus of texts. Kelley reported having been given 21 letters uniquely characteristic to the alphabet. This resulted in the book Liber Loagaeth. The book consists of 49 letter tables, made of 49 x 49 letters. Each table has a reverse side- making 98 49×49 Tables collectively. 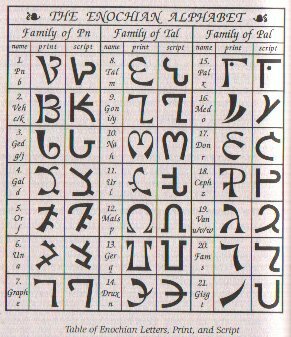 The corresponding set of Enochian characters was translated to Kelley in Krakow the following year. Their importance is paramount because they are complimented with English translations, providing the basis for the Enochian vocabulary. The texts comprise 48 poetic verses, which Dee describes as “Claves Angelicae”, or “Angelic Keys”. These Keys that are assigned certain functions were to be used by Dee to ‘open’ the 49 tables in the Liber Loagaeth. Dee believed that hidden within these tables were the formulas that governed the way in which the universe was constructed, the frame work of creation, and the power by which we were all made. With the dictation of the Enochian tables complete Dee and Kelly were instructed to visit the court of Rudolph II, the ruler of Bohemia and the Holy Roman Empire. An act that could be seen as High Treason in the eyes of Queen Elizabeth I. 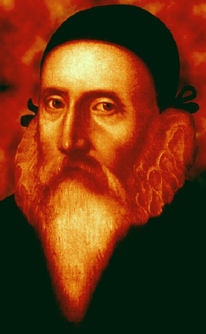 In August 1584 John Dee entered Prague to confront the Ruler of the Holy Roman Empire and rebuke him for his transgressions. Dee issued the Patriarch an ultimatum, that unless he take heed of this revelation and renounce his excursions into the bizarre, by divine right he would be pushed off his thrown and his kingdom dissolved. Rudolf largely dismissed the warnings and would have extradited the magician back to England had it not been for the one thing Rudolf wanted that he believed Dee could deliver him. 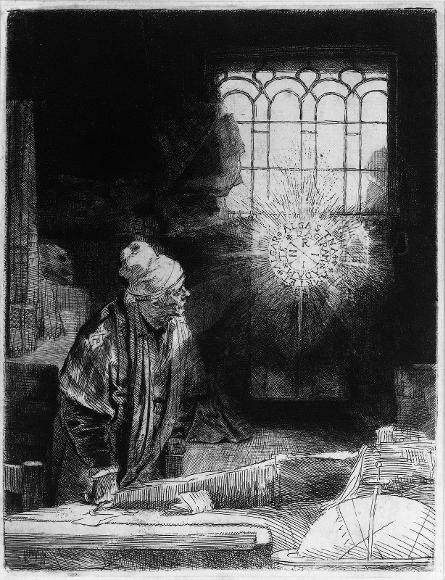 With advances in metallurgy and chemistry, the lure of the Philosopher’s Stone and the alchemical secret of converting lead into gold, proved too much of a temptation for Rudolf. 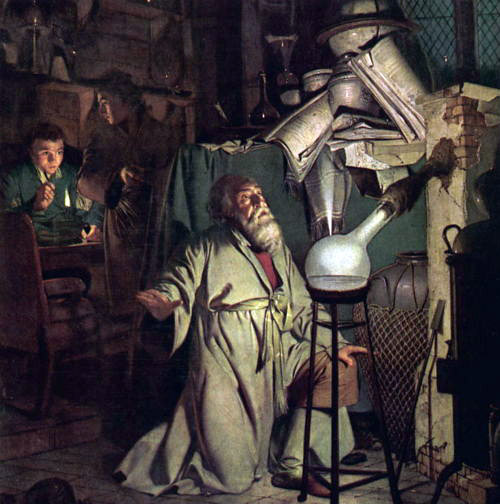 Although he mostly dismissed Dee’s warnings he allowed him and Kelly to stay in Bohemia and establish an alchemical laboratory. When Kelly first arrived at Mortlake he had with him a bag of red powder (possibly red mercury) he said he stole from an ancient sight in Glastonbury. He believed it was the vital ingredient in the transmutation of base metals into Gold. Pope heard Dee had been granted audience with Rudolf he dispatched spies to Prague to investigate. The papal authorities regarded Dee with more than suspicion, they resented his presence and embarked on a character assassination campaign in the hopes of expelling him from the country. Dee was labeled a manipulator and accused of subverting Rudolf and precipitating the fall of the Church. They accused him of contriving to engineer the redundancy of their Holy Orders and the station of the Pope. Pope Sixtus sent a letter to Rudolf accusing Dee of being a Black Magician and demanded he be expelled. 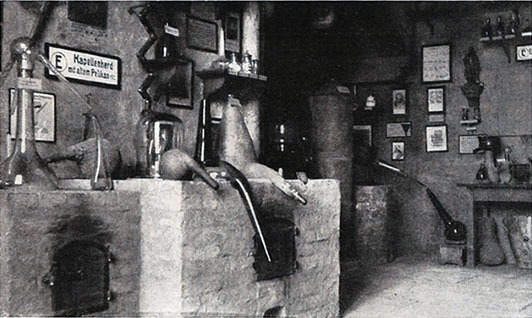 Papal ambassadors made repeated demands to question Dee and examine the various paraphernalia housed in his laboratory. When the Pope demanded they be sent to Rome to face the Inquisition, they refused. Rudolf was under extreme pressure from the Pope to capitulate. He believed Dee and Kelly were on the verge of finding the key to the philosopher’s stone but wouldn’t openly defy the Pope. He secretly installed Dee, Kelly and their families in secret laboratories in the town of Trebon, at Rozmberk Castle. There the experiments intensified and Both Dee and Kelly are pushed to exhaustion and their health suffers. Conflicts ensue. Kelly is only concerned with the material rewards the philosopher’s stone will grant. Dee returned to England in 1589 desperately short of money, with his wife pregnant with the product of her unholy union with Kelly. Dee never questioned the validity of his investigations, the thought that he had been defrauded by Kelly never entered his mind. Dr John Dee died in 1608 having never completely deciphered the Enochian language, and one is left with the feeling that much of his work was left unfinished. Even so Modern Science has shown Dee’s instincts were fundamentally correct. Scientists have now discovered that there are unseen forces that govern the physical world, and today the Enochian language has become a system for affecting change in the outside world by means of will. Dee’s attempts to discover the secrets of the universe came to naught, but what is left behind is inexplicable, an enigma, a mystery.m, Dee is after something much deeper, a map into an unearthly territory whose reward is intangible. Their experiments fail and after a 7 year partnership they separate. Kelly is invited to work directly for Rudolf in Prague. inexplicably word spreads that he has discovered the secret to producing the Philosopher’s Stone. He was made a Baron, given a castle and lived a life of excess. His reputation proceeds him, word spreads through Europe and reaches Queen Elizabeth, who sends spies who try to entice him back. Unfortunately his fame is short lived, unable to produce the copious quantities of Gold that Rudolf craves he is thrown in prison. Kelly died attempting to escape from prison taking with him the truth behind the discovery of the formula for converting base metals into Gold. Pingback: Jae Kamel’s URLs Presents… The Free List. | Dr. Jone's Blessings. Pingback: Renaissance Studies. | Dr. Jone's Blessings. Pingback: The Free List Summer Update | Dr. Jone's Blessings.